You’re too kind, thanks Carolina! Well there has to be action somewhere, as there isn’t much in me these days, looking forward to coolness! Thanks Kerfe. I just got in…brutal out there. Stay cool! Yes, or maybe the artist on drugs. The ice cube feeling kind! I was thinking the same, thanks Jean. Oh I do really miss other stuff, tried some ink work today, quite a disaster, I have forgotten how they work, or I might blame it on my hand made claybord, he he, I will try to revive it tonight, a little fatigued today, grrr. I hope you revive soon, Rebecca, and boy, you and me both re: something different. I can’t wait! Ampersand sent me a free sample of their Pastelbord and I’m dying to have a go with it. I don’t feel I’m any good with pastels but I was thinking of trying an abstract…. Thank you, Amy. Looking forward to your pastel work! This is an excellent abstract Laura! Oh gessoooo….I love the gessssssooooo. It is hot. I want low nineties…not low hundreds…in fact, I want high 70s. I want low 70s! Dare we go lower? Lol! I would even be happy with 57. Or 37 really. I wasn’t built for the heat. I don’t know how you do it! I crack up every time I say this but….it is a dry heat and that makes a world of difference. But yes, I am not fond of hot. My favorite season is fall. Me too. What’s the temp like there in the fall? October starts cooling off and gets in the mid seventies then it gets progressively colder so that by November highs in the sixties and December in the 50’s maybe? I went to Georgia once during the summer for a few days…that is a wet heat. I thought I was gonna die there. It was like trying to breath under water! I thought it was raining when I got off the plane. NO!!!!! Wisconsin didn’t seem much better. I’m east coast too and we have that humid heat also. Yeah it is just like that. Although I’m sure Georgia is hotter. Dry heat would be better, but cool breeze, even better. But if every day were 73, we wouldn’t appreciate them! So true. I do like the four season here but not so much the windy springs. Too much dust and tumbleweeds. Ooh yeah I wouldn’t like that either. If I can find a picture of my tumble weed issues, I will email it to you. well….stomp back! lol….the gesso worked and it is still your painting and your moment…. A patriotic feel! Maybe all the politics in the back of your mind 😉. Fun gesso magic!! Thanks, Jodi. Just wanting to play and make a beautiful purple or two hehe. Wow, gesso center stage! I see stairs, diamonds, a pattern….no two patterns, a frame and wild colors waiting to burst and occupy! 😀 So many things going on with just a flick of gesso magic wand! SUPER! Thanks Carrie! Glad you enjoyed, my friend. Sometimes we have to,dabble around to find our true love. I really like this so don’t give up on watercolor just enjoy the process. Thanks, Teri. I’ve not given up on it, I think I just need a break though. Breaks can be refreshing! 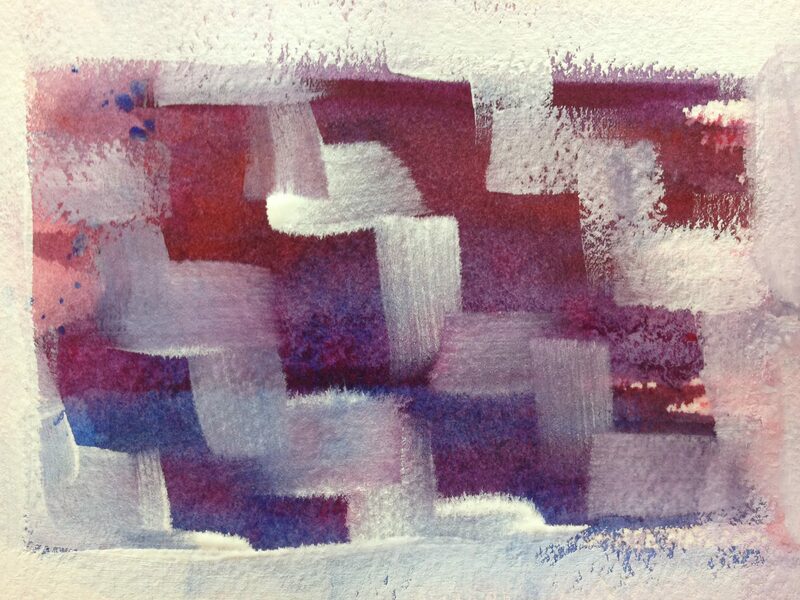 A nice feel to this painting – looking forward to your acrylics! Good, it is whatever inspires you. I love your abstracts – I can see all the way into them! Thank you; that’s very kind of you, Mary! Hahaha… You doing so well with watercolors that I think we should extend the month to August! Seriously, I love how you always manage to save the day with combinations with acrylics and gesso. One cannot see any mistakes or traces of suffering in your paintings – they look great!